Hi, I am interested in your 1956 Chevrolet Corvette (stock #1269-NSH) listed on Autotrader for $129,995. I'd like to get more information about this vehicle and confirm its availability. For some reason this Corvette looks lower, leaner and meaner than most. And thats because it is! 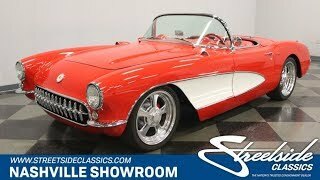 Its a freshly minted, first-class resto-mod that starts out with the awesome good looks of a 56 Vette and then builds it up with modern running gear that makes it,... lower, leaner and meaner. Check it out. 1956 brought with it a new face for the Corvette by perching the headlights out on newly extended front fenders. The toothy chrome grill remained about the same, which is a good thing. Chrome still surrounds the new headlights but now the bumpers on each side of the grill bend around the corner to connect up with the chrome that outlines the new cove in the side of the body. That cove creates a perfect opportunity for a two-tone paint job, and this car is coated in Torch Red with White coves. The rear fenders bend up and over the rear wheels and then down to meet the trunk line at the bumper. Chrome trims out the rear edges of the fenders with the exhaust exiting out in the center and also underlines the trunk on either side of the license plate. So, it all looks like a great, classic, 56 Vette, but there is still something about the way the car sits that looks different. And well get to the reason for that in a minute. First lets check out the gorgeous Red interior of this car. It builds off the original, but takes it to the next level with meticulous attention to detail, lots of polished chrome, and some modern tech for your convenience, pleasure and comfort. The door panel is the first example of that with the chrome panel across the top edge polished to a mirror like shine. A pleated red center is dressed out with more chrome as well and theres some hammered steel along the bottom. The Red leather seats are stitched up old world style with pleated centers and smooth bolsters and a Red steering wheel is mounted on a brushed metal three spoke hub which frames the wedge-shaped speedo pod nicely. The ignition switch along with the engine gauges are spread across the red dash panel and trimmed in chrome. Just above the tach in the center is a Pioneer stereo has been added for your listening pleasure. Mounted in the floor is a sign of the technology that rests below it. A shifter for a modern 4-speed automatic transmission. Before you open the hood, you may want to grab your sun glasses. Just sayin. Because under there you will find an LS2 engine for which many buffing wheels gave their lives to create. But before they dropped that shiny 6.0-liter motor down in there, they polished up the firewall and fender wells to a show winning finish so that it all looks gorgeous. A free flow air filter feeds the dramatic looking intake that shines in all its highly polished glory. The alternator, air conditioning compressor, master cylinder and brake booster are also all chromed. An aluminum radiator keeps things running cool and the fuel injection system is tunable. Underneath this car you will find the same attention to detail, but it was lavished on modern tech like the coil over suspension with tubular A-arms in the front and a 4-link rear end as well as the 4-wheel disc Wilwood brake system with drilled and vented rotors. Billet Specialties wheels with 235/40R18 tires mounted complete the look of this car perfectly. This is a fresh build that is looking for the right person to take it out and show it off. We promise that whoever that lucky person is will have fun along the way. Come on down and check this sweet ride out.